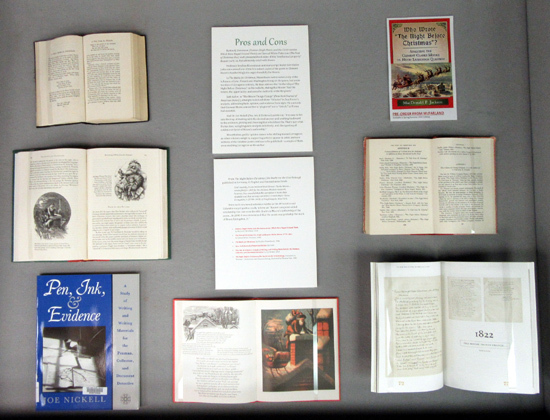 NYSED / OCE / NYSL / Research Library / Seventh Floor Exhibits / Revisiting "A Visit from St. Nicholas"
Exhibit: Revisiting "A Visit from St. Nicholas"
But who created those stirring words to the start of what have been called "arguably the best-known verses ever written by an American"? First published anonymously in a Troy newspaper in 1823, "A Visit from St. Nicholas" has long been credited to Clement Clarke Moore, a wealthy New York City language professor and Bible scholar. But currently there is a growing belief that it may have actually been written by Major Henry Livingston, Jr., a Dutch land surveyor and "gentleman-farmer" from Poughkeepsie, NY. 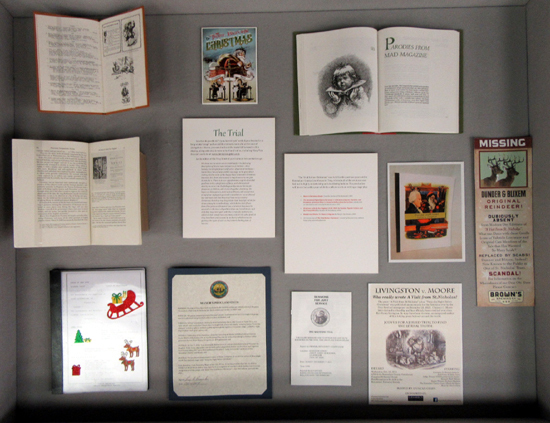 The New York State Library’s December exhibit showcases the cherished Christmas classic that has become a local literary whodunit with a display of numerous editions of the poem itself, as well as other materials that address this intriguing controversy. "A Visit from St. Nicholas" (also known as "’Twas the Night Before Christmas") was originally published in the Troy Sentinel, on December 23, 1823. It appeared without attribution and continued to do so for the next fourteen years as it made its swift and merry way, like Santa's sleigh, all around the world. 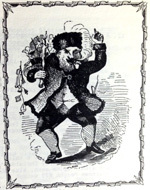 In New-York Book of Poetry, in 1837, Charles Fenno Hoffman identified his friend Clement Moore as the author of this now widely circulated and beloved holiday poem. In 1844, Moore included it in an anthology of his own, referring to it as his long-ago "trifle"—a thing he hadn't cared to acknowledge before, but would happily do so now. Henry Livingston, who died in 1828, just five years after the poem first appeared in the Troy newspaper, never claimed authorship either. But by the turn of the century, members of the Livingston clan had begun to publicly insist that he was the one who had actually written it, citing family lore and other possible proofs. The controversy has never been definitively settled, though it's been raised periodically over the years. In 1919, the Dutchess County Historical Society wrote: "A critical comparison of the 'Visit from St. Nicholas' with the acknowledged verses of Henry Livingston adds internal evidence supporting the correctness of the family’s position." The case for Livingston got another boost recently when Vassar professor Don Foster, at the behest of one of Henry's descendants, genealogist Mary Van Deusen, agreed to deploy "linguistic forensics" to help resolve the matter. In Author Unknown, Foster concludes that the evidence points decisively to Henry Livingston as the poem's true progenitor. "A Visit" underwent numerous edits between 1823 and 1844. Most of these involved relatively minor changes to punctuation, typography, and spelling (thro/through, sprung/sprang, peddler/pedlar, etc.). 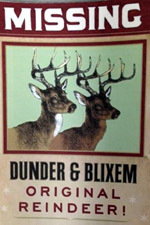 But perhaps the most telling alterations had to do with a couple of reindeer names, which morphed from "Dunder and Blixem" (Dutch for thunder and lightning) to "Donder and Blixen," and eventually to the German "Donder and Blitzen." Burton E. Stevenson (Famous Single Poems and the Controversies Which Have Raged Around Them) and Samuel White Patterson (The Poet of Christmas Eve) each presented both sides of this "intellectual property" dispute early on, but ultimately sided with Moore. Professor Stephen Nissenbaum and manuscript dealer Seth Kaller (who once owned one of the few extant copies of the poem in Clement Moore's handwriting) also argue forcefully for Moore. In The Battle for Christmas, Nissenbaum writes extensively of the influence of John Pintard and Washington Irving on the poem, but omits mention of Livingston entirely. He does address the "Authorship of The Night Before Christmas" on his website, stating that Moore "had the means, the opportunity, and even the motive to write the poem." Seth Kaller, in "The Moore Things Change" (New-York Journal of American History), attempts to debunk three "fallacies" in Don Foster's analysis, addressing facts, opinion, and evidence from style. He contends that Clement Moore was neither a "plagiarist" nor a "Grinch," as Foster had asserted. And Dr. Joe Nickell (Pen, Ink, & Evidence) points out, "It is easy to fall into the trap of starting with the desired answer and working backward to the evidence, picking and choosing that which best fits. That's just what Foster does, using linguistic analysis selectively, and disregarding all evidence in favor of Moore's authorship." Nevertheless, public opinion seems to be shifting toward Livingston as other scholars weigh in, supporting articles appear in print, and new editions of the timeless poem continue to be published—a couple of them even crediting Livingston as the author. Until recently, it was believed that Clement Clarke Moore … wrote [this] in 1822 for his children. Modern research, however, has revealed that this ascription is more than doubtful and that we may owe it to a certain Major Henry Livingston, Jr. (1748–1828) of Poughkeepsie, New York. 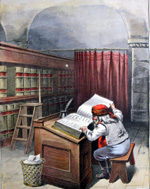 Even such renowned reference works as the Britannica and Columbia encyclopedias coolly inform us: "Recent computer-aided scholarship has cast considerable doubt on Moore's authorship of the poem... In 2000 it was determined that the poem was probably the work of Henry Livingston, Jr."
So what do you think? 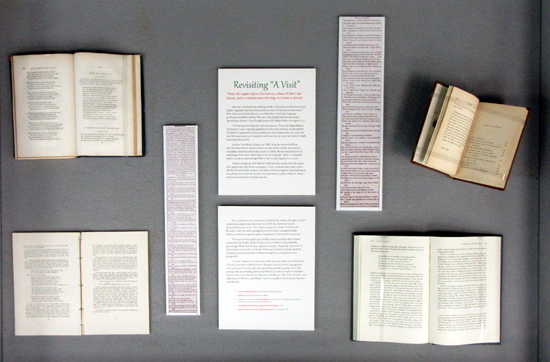 If you haven’t yet "settled your brains for a long winter's nap" and would like to learn more about the case of Livingston v. Moore, you can check out the material featured in this display, along with much more to be found online, including Mary Van Deusen’s website. 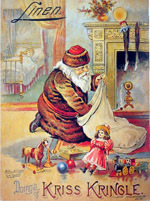 We know not to whom we are indebted for the following description of that unwearied patron of children—that homely, but delightful personification of parental kindness—Sante Claus, his costume and his equipage, as he goes about visiting the fire-sides of this happy land, laden with Christmas bounties; but, from whomsoever it may have come, we give thanks for it. There is, to our apprehension, a spirit of cordial goodness in it, a playfulness of fancy, and a benevolent alacrity to enter into the feelings and promote the simple pleasures of children, which are altogether charming. We hope our little patrons, both lads and lasses, will accept it as proof of our unfeigned good will toward them—as a token of our warmest wish that they may have many a merry Christmas; that they may long retain their beautiful relish for those unbought, homebred joys, which derive their flavor from filial piety and fraternal love, and which they may be assured are the least alloyed that time can furnish them; and that they may never part with that simplicity of character, which is their own fairest ornament, and for the sake of which they have been pronounced, by authority which none can gainsay, the types of such as shall inherit the kingdom of heaven. "The Trial Before Christmas" was held for the past two years at the Rensselaer County Courthouse in Troy, wherein all of the evidence was laid out in highly entertaining and elucidating fashion. The production will be on hiatus in 2015 while its authors work on writing a stage play.